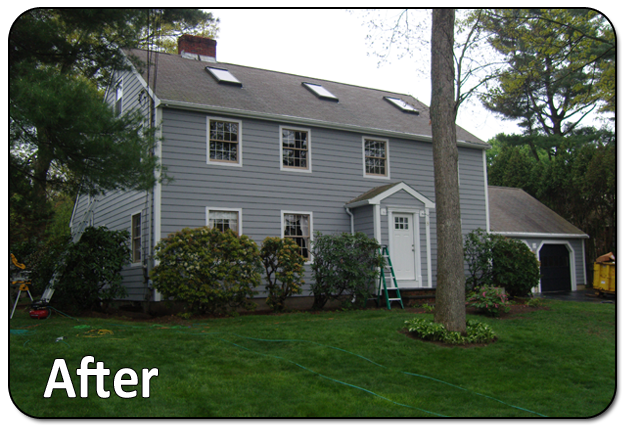 Here at Everlast, we are proud to say that we are a local siding contractor servicing the Braintree, MA area. Many homeowners in New England have been falling in love with Everlast siding for its traditional styling and beautiful texture, along with its incredible durability. With many projects done in close proximity, here's one of our favorites that was recently completed this past summer. This home had old wood siding that was deteriorating at a fast pace. The homeowners could not bare watching rot and holes in their siding continue to ruin the curb appeal of their home. They decided to take action and gave us a call for a free estimate on their home and a showing of Everlast Composite siding. The homeowners were looking into having fiber cement siding as a possible replacement, but they loved all of Everlast's superior qualities in regards to its durability, styling, and warranty. Did I mention the homeowners were thrilled to know that they would never have to paint their home again once they chose Everlast? Also, they were excited that the only maintenance they had to do was hosing the house down once in a while, as is true with any siding. Their house went through a complete renovation and the results were spectacular! We removed all of the existing siding and replaced it with our 7" Seaside Gray clapboard, while replacing all the trim with white PVC cornerboards. Everwrap was used in for the moisture barrier and everything was held together with stainless steel ringshanked nails. We loved seeing the homeowners reaction when we told them their home was finished. 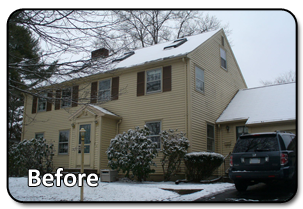 They could not have been happier with their decision to go with Everlast Composite siding.